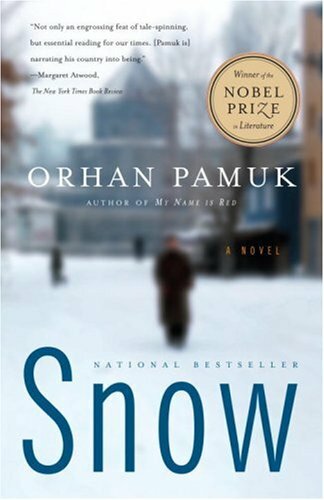 Snow, a novel by contemporary Turkish author and Nobel Prize winner Orhan Pamuk, is widely regarded as a great work of literature. The story is told simultaneously from two angles: that of the protagonist, a poet named Ka, and the wider political context of the cultural change in Turkey following the rise of Ataturk. I suppose it must be noted here that I find this novel particularly fascinating because I also find Middle Eastern and Turkish history incredibly intriguing. However, you do not need to be a historian to read this book: ultimately, it is a work that focuses on the life of its protagonist and does not dwell on any sort of political or historical context. Anyone who loves a compelling and beautiful story will enjoy this novel — the setting of dramatic cultural change in Turkey is only a bonus for those of us who happen to be interested in it. Of course, the history is central to the plot, but all is explained. In summary, the book takes place in a small city in Turkey called Kars. Ka, the poet-protagonist, visits the border city from his home in Germany, with the intention of doing journalistic work on the recent plight of the “head scarf girls” — a group of school girls who, rebelling against Ataturk’s westernizing policies, have continued the tradition of wearing head coverings. However, Ka also has another intention: to win the love of Ipek, the girl from his childhood whom he hopes to marry and take back to Germany with him. (Her younger sister, coincidentally, is the leader of the head scarf girls.) The majority of the novel takes place within a few days, as a blizzard descends on Kars and no one can get in or out. Violence escalates in the small city as the head scarf drama unfolds and multiple religious and secular groups clash. It is important to note here, I believe, that this by no measure reads like a thriller: instead, it is a poignant account of Ka’s few days in Kars, the poems that he writes there, his relationship with Ipek, and his reluctant role in the violence that begins to unfold. Without giving anything away, it must be said that this is a tragic story. Ka’s character is not a perfect one: he is flawed, like any human being, which makes him so much more compelling. His time in Kars revolves around the poems he is able to write in the city, which flow from his pen more easily than they have in many years. These poems, he decides, represent different facets of his conscience (reason, imagination, memory), but ultimately they lead to little conclusion in terms of self-discovery. This is a complex novel, and one that can be confusing to read, but the language is beautiful and the plot is mesmerizing if you allow yourself to get into it. Snow is not a light and fun read, but it is a wonderful piece of literature (it almost reads like a meditation) that I would highly recommend to anyone. Pamuk gives us what all novelists give us at their best: the truth. Not the truth of statistics, but the truth of human experience at a particular place, in a particular time. And as with all great literature, you feel at moments not that you are examining him, but that he is examining you. … Just some food for thought. Have you read Snow, or any of Pamuk’s other works? What were your thoughts? If not, do you plan on reading any of them?